Odo was one of the "Hundred Changelings", a group of one hundred newly-formed Changelings that the Founders sent out into the galaxy to gather information and explore, and did not expect to return until the late 27th century. Odo was found adrift in his natural gelatinous state in the Denorios belt in the Bajoran system and was brought to the Bajoran Institute for Science where he would be studied by Doctor Mora Pol for seven years. Not initially recognizing Odo as a sentient being, Mora subjected him to a long series of experiments, in which Odo endured time in a vacuum chamber and a protein decompiler, as well as extensive electric shocks. Odo eventually rebelled against Mora's unintentional mistreatment by forming into a tentacle and hitting him, before later forcing Mora to recognize him as sentient by copying a beaker on a laboratory table. Mora continued to study and teach Odo during the Occupation of Bajor, assisted by Dr. Weld Ram. When Odo assumed humanoid form, he copied Dr. Mora's hairstyle. During the Occupation of Bajor, Odo performed a Cardassian neck trick that greatly amused the Cardassian officers. When Odo left Doctor Mora's institute, he did not leave on good terms; he resented some of the methods Mora had used on him, and blamed him for not realizing that he was sentient. Odo's name stemmed from the Cardassian word for "nothing", Odo'ital, which was the loose translation of the "unknown sample" label in Bajoran on his laboratory flask. Later on, his name was shortened to "Odo". He himself used only the single name "Odo." Early in his life, when he heard others address him as "Odo", he heard it as "nothing." He felt that the name was appropriate, since he had no friends, no past, and no form; once he had gained the respect and affection of Kira and the others on the station, he ceased hearing "Odo" as "nothing" and simply considered it his name. At some point during the occupation, Odo arrived on Terok Nor. He was seen as an impartial outside observer and often settled disputes between the Bajoran workers on the station. In 2365, due to his reputed neutral position, Odo was recruited by Gul Dukat to investigate the murder of a Bajoran collaborator. Among his chief suspects was Kira Nerys. Odo was able to discover that she was a Bajoran resistance fighter. He lied about this to Dukat and did not reveal her identity. He discovered in 2370 that she was indeed the murderer. In their initial encounter, Kira sardonically called Odo "Constable", a term she later adopted as a term of affection, and which eventually fell into common use as an unofficial title for him. Odo continued working for the Cardassians, eventually becoming chief of security. In 2366, Odo investigated an assassination attempt (a bombing) on Dukat. Three Bajoran workers were initially linked to the attack, and Odo – too concerned with maintaining order and the rule of law – hurriedly convicted them and allowed them to be executed. If he had performed any kind of investigation instead of relying on circumstantial evidence, he would have seen that the three men were clearly innocent. However, he didn't know the difference between "order" and "justice" at that time. A bombing identical to the one that nearly killed Dukat occurred three days later, and Odo realized the men had been innocent and that his lax investigative procedures had caused a serious miscarriage of justice. This incident prompted him to be much more insistent on actual justice, though not necessarily the actual letter of the law. Odo's guilt was revealed when, after traveling through a plasma storm, his mind formed a link with the other passengers – Captain Benjamin Sisko, Garak, and Lieutenant Commander Jadzia Dax – and caused them to relive what had happened seven years prior, the three men taking on the roles of the convicted men while Dax represented an unidentified Bajoran woman in an hallucination of the past. Later in 2366, Odo was designated an officer of the Cardassian court in order to testify in criminal cases. It was quite clear that his Cardassian employers still viewed him with suspicion; an automated counter-insurgency program designed to activate in the event of a slave revolt on the station was programmed to raise a force field around Odo's office on the assumption that he would shift sides to aid the insurgents. As an investigator in a totalitarian regime, Odo was occasionally required to operate outside official channels, and he maintained a clandestine network of debts and allegiances to high-ranking members of the Cardassian government, which he could call on when needed. In the course of his career, he developed an extensive knowledge of espionage and assassination techniques, such as poison, explosives, and scrambling signals. Odo retained his post as chief of security even after the Cardassian forces withdrew from the space station in 2369, when the station fell under Federation administration and was renamed Deep Space 9. At first, Odo and Starfleet Commander Benjamin Sisko, the station's then-new commanding officer did not see eye-to-eye on how station security should be handled, but they eventually became close associates. Sisko stood by him when he was accused of killing a Bajoran he had arrested years earlier. When the Bajorans on the station became unruly and wanted to harm Odo, Sisko protected him. The situation was resolved when it was discovered that the Bajoran, Ibudan, had faked his own death in order to take revenge on Odo. Having been found in the Denorios belt, the discovery of the Bajoran wormhole provided Odo with further opportunity to investigate his origins. He was tricked by Croden into believing he had discovered Odo's people. The story had been fabricated by Croden to manipulate Odo into helping Croden rescue Croden's daughter. Croden apologized to Odo for the deception and wished him luck in finding his people. Odo resolved a conflict between Kira, who threatened mutiny, and Sisko, who wanted to arrest her for treason. Both were being mentally affected by Saltah'na energy spheres that contained a log of a similar battle in an ancient culture, causing the crew to do the same thing. Fortunately, Odo's non-organic nature rendered him immune to the effects of the spheres, and with the aid of Doctor Bashir, he was able to remove the spheres' influence and eject them out of a cargo bay door. As the outcome of an investigation regarding a Cardassian claiming to be war criminal Darhe'el, Odo managed to prove that the man was actually Aamin Marritza, a file clerk for Darhe'el who wanted the Cardassian people to realize their crimes. In 2370, an extremist group of Bajorans known as the Circle, led by Minister Jaro Essa and supported by Vedek Winn Adami, demanded that all non-Bajorans leave DS9 and Bajor. Civil war threatened the planet, but Quark informed Odo that the Circle was being helped and financed by Cardassia in order to drive out the Federation, leaving the planet ripe for reconquest. Weapons had been smuggled to the Circle through Kressari traders, which Odo revealed by using his shapeshifting abilities to "borrow" a manifest with a gul's thumbscan on it. When Odo was affected by a gas in the Gamma Quadrant that turned him into a destructive creature, Dr. Mora, the scientist who had discovered him, helped cure him. Together with Lieutenant Jadzia Dax, Odo, while in the Gamma Quadrant, discovered a planet where people were disappearing. The people were actually holograms created by Rurigan, the sole survivor of a planet destroyed by the Jem'Hadar. Odo and Dax fixed the holographic projector and restored the people. In the process, Odo formed an attachment to a girl called Taya, even shifting into a spinning top for her amusement before he and Dax departed. Odo helped represent Miles O'Brien in a Cardassian court on false charges of aiding the Maquis. Odo's knowledge of Cardassian law annoyed the court, and his delaying tactics provided time for Sisko to prove the evidence false and gain O'Brien's release. During a mission to locate the Founders of the Dominion in the Gamma Quadrant, Odo found himself drawn to a rogue planet in the Omarion Nebula. There, he discovered that the Founders were in fact Changelings like himself. After initially becoming annoyed with shifting into every plant and rock he could see, with the aid of the Female Changeling he changed into a bird and took flight, finding that he enjoyed exploring his shape-shifting abilities. He soon discovered the Founders' distrust of "solids", though, and rejected them in favor of his friends, with the Female Changeling acknowledging his request for the time even if she warned him that he wouldn't be as fortunate in future interaction. Later that year, Odo had another encounter with the Founders while he was on an away mission with Kira. They landed on a planet to answer a distress call that seemed to come from a Maquis raider in the area. While on the planet, Kira was captured and the Female Changeling assumed the appearance of Kira. The Changeling pretended that she was trapped inside a growing crystal that was suffocating her. After Odo admitted having romantic feelings for Kira, he was able to see through the ruse when she claimed to feel the same way; he was sure that Kira didn't love him, but knew she wouldn't lie to him about something so important. It gave the Changeling an understanding of Odo's feelings for Kira, although Odo still refused to admit how he felt to the real Kira, simply claiming to have seen through the deception due to a 'slip of the tongue' that the real Kira would never have said. In 2371, a newly-"born" Jem'Hadar was found among the wreckage of a salvaged ship Quark had purchased. The baby matured into an adolescent within days, and as a Changeling (and therefore a Founder in the boy's eyes), Odo inherited the responsibility of looking after him. The Jem'Hadar was willing to do literally anything Odo asked of him. Odo tried to break the boy of this habit and encouraged him to think for himself and resist his inborn tendency toward violence. Ultimately, the boy decided that he belonged with the other Jem'Hadar and that anyone who was not Jem'Hadar was his enemy, arguing that if Odo actually accepted his right to self-determination, he would respect his wishes. Odo, wanting to protect the crew, escorted the boy to Dominion space. It was also during this time that Odo had requested his own personal quarters, and was decorating them with furnishings appropriate for himself, allowing him to experiment with his abilities in private. Also in 2371, Odo was forced to admit to Elim Garak that, despite his disgust at the Founders' behavior, he still wanted to return home. He accompanied Garak in an attempt to contact Enabran Tain. Odo became a prisoner of Tain, who was plotting, along with the Romulans, the extermination of the Founders. The plot failed, and Odo was aided in his escape by a Founder who was posing as a Romulan on Tain's ship, although he still rejected the offer to return home. This resulted in the Battle of the Omarion Nebula, in which both the Romulan Tal Shiar and Cardassian Obsidian Order were decimated. Odo also served as host for Curzon Dax during Jadzia Dax's Trill zhian'tara, during which Odo shifted into a form resembling Curzon. Initially, the two wanted to stay together, but Curzon was eventually convinced to return to the Dax symbiont. This gave Jadzia a greater understanding of the joy Odo found in his shape-shifting abilities, and Odo learned how much fun solids had staying up all night drinking and playing tongo. In late 2371, Odo was forced to kill a Changeling posing as Ambassador Krajensky, who had tried to provoke a war between the Federation and the Tzenkethi. By killing the imposter, Odo became the first Changeling ever to harm another. Odo – along with Rom, Quark, and Nog, – time-traveled to Earth of 1947. None of the Ferengi were aware of Odo's presence until he revealed himself as having shapeshifted into the guise of a German Shepherd dog, Odo having sneaked onto a shuttle the Ferengi had traveled there in, Quark's Treasure, in order to catch Quark in flagrante delicto, smuggling. This became known in Human history as the Roswell Incident. Along with the three Ferengi, Odo eventually managed to escape back to the 24th century and Deep Space 9. In 2372, Odo accompanied Sisko, who now held the rank of captain, on a trip to Earth to advise Starfleet on the Changeling threat. Odo was able to demonstrate to the organization how easy it would be to infiltrate Starfleet, and subsequently helped free Sisko from a prison after Admiral Leyton, a former mentor to Sisko, was revealed to be staging a military coup. While visiting Earth on this occasion, Odo was secretly infected with a morphogenic virus by rogue organization Section 31, in the belief that he would eventually link with others of his kind, transferring the disease and ultimately eliminating his entire species. Odo protected Shakaar Edon, the head of the Bajoran government, while Shakaar visited the station, even though Odo was jealous of him because Shakaar was in a relationship with Kira. When Worf's brother, Kurn, arrived on the station after being dishonored by the Klingon High Council due to Worf siding with the Federation in a Klingon attempt to conquer Cardassia, Odo gave Kurn a job of security officer, although this ended when Kurn made near-constant attempts to commit suicide. Odo also went on a joint mission with the Jem'Hadar to stop a group of renegade Jem'Hadar from capturing an Iconian gateway. Later that year, Odo became desperately ill, not as a result of the virus, but because he had been poisoned by his own people in order to force him to return to them for treatment. Once there, he was judged by the Great Link and forced into his humanoid form permanently, unable to change shape, as punishment for harming another Changeling. While Odo was locked into a humanoid form, it hinted that he was essentially still a Changeling because, as Dr. Bashir later pointed out, Odo's brain still contained morphogenic components. The other shapeshifters may have just used their greater collective ability while linked with Odo to force him to alter his form into that of a humanoid, guiding the specific elements of his transformation such as Human physical makeup based on their expert knowledge of Humans. While part of the Link, Odo unwittingly infected his entire race with Section 31's bioweapon. Also, owing to information Odo had gleaned in the Link, he was convinced that Chancellor Gowron, the leader of the Klingon Empire, was actually a Founder. Permanently locked into his solid state, Odo became extremely depressed. He found some comfort in the new sensations of eating and drinking, but this gave him little solace. Odo's frustration was exacerbated when Captain Sisko decided to bring him on an undercover mission to expose Gowron as being a Changeling infiltrator. If Odo had still been a Changeling, he could have simply changed into Gowron's pet targ. Instead, he, Sisko, O'Brien, and Worf disguised themselves as recipients for the Order of the Bat'leth and attempted to use polaron radiation to expose Gowron as a Changeling. Odo, using the alias "Kodrak", proved to be a less than intimidating Klingon, but the mission went as planned until someone recognized their true faces. The Starfleet officers were exposed and nearly executed, but General Martok helped them escape to complete their mission in the name of the Empire. Although Worf almost killed Gowron in honorable combat, Odo had deduced, by this time, that "Martok" was the true Changeling and Odo's information about the infiltrator had been deliberately falsified by the Founders to provoke further unrest between the Federation and the Klingons, weakening them and paving the way for a Dominion invasion of the Alpha Quadrant. The mission was ultimately a success and the Martok Changeling, having been identified by Odo, was killed by a barrage of disruptor fire. Before undoing Odo's Klingon alterations, Bashir mentioned that he could surgically alter Odo's face to realistically resemble any humanoid; Odo declined the offer as he preferred his face the way it was. It was during Odo's time as a solid that the USS Defiant, through the treachery of an undercover Klingon named Arne Darvin, was sent back in time to the year 2268. The ship found itself near space station K-7 at a crucial moment when Darvin had been exposed as a spy and subsequently disowned by his people. Odo helped search for an explosive tribble to prevent Darvin from killing James T. Kirk, and even acquired one as a pet. He found Worf's recounting of the Klingons' "war" against the tribbles rather amusing, finding it hard to believe that a cute ball of fur was a "mortal enemy" of the Klingon Empire. Apparently, the Founders' attempt to force Odo to remain a solid took some time, as a plasma storm later reacted with leftover morphogenic enzymes and therefore caused his mind to telepathically reach out to link with other Changelings. At the time, he was returning from a conference with Sisko, Garak, and Dax, when the four of them were suddenly trapped in a dream-like but utterly realistic recreation of the Cardassian Occupation based on Odo's memories. The people in the dream believed them to be a group of Bajoran terrorists who had been executed during the Occupation, but instead of Odo, his predecessor Thrax was in charge. 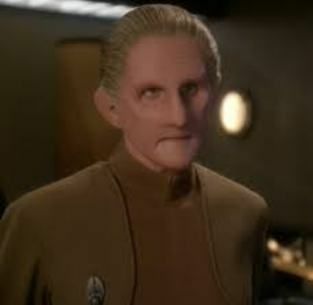 Odo did not realize (or did not want to admit to himself) that Thrax's actions in the dream were in fact a recreation of his own, and their personae there were a group of innocent Bajorans who had been executed because Odo had sided with "justice" rather than his sense of right and wrong. The experience, a product of Odo's guilt, persuaded him to admit the truth to himself and others. In 2373, Quark found an infant Changeling among some salvage he had purchased and sold the infant to Odo. He, in collaboration with Dr. Mora, made attempts to teach the infant, which was very ill, to change form, just as Mora had done with Odo himself. Though their attempts did result in making the infant form a face to look at Odo (along with various other shapes, assuming them seemingly at a much faster rate than Odo had when in Mora's care), its morphogenic matrix began to destabilize. As it died in Odo's hands, it linked with Odo and restored his morphogenic matrix, allowing him to change form once again. This was done as a means of thanking its mentor for all that he had tried to do. As Dr. Mora departed the station, he encouraged Odo to think of his restored abilities as a gift the Changeling had wanted him to have, and Odo, in return, told Mora that he now had a better understanding of what Mora had done for him years ago. After the Dominion captured Deep Space 9, Odo was one of a few crewmembers who remained on the station, retaining his old role as constable, only with Dukat in charge. Odo joined the Ruling Council at the invitation of Weyoun. After the Female Changeling arrived on the station, his loyalties were questioned. The Female Changeling realized that the reason Odo remained with the solids was his love for Kira. She linked with Odo, hoping to manipulate him. While Kira led a resistance cell, Odo did nothing to help. Rom was arrested, but Odo again did nothing, stating that he was at peace after his linking. His inaction directly led to thousands of deaths as Starfleet was forced to accelerate their plans to retake DS9, going without an entire fleet to meet an enemy who outnumbered them two to one. Kira was later put into the brig and when the Female Changeling explained her plans for the solids, including the execution of Kira, Odo's eyes were opened. During a subsequent battle to retake Deep Space 9, he helped Kira and Rom escape from custody. Odo and his security forces attacked the station's guards, allowing Kira and Rom to disable the station's weapons system, helping the Defiant to retake the station. In 2375, Odo tried to help Weyoun 6 defect to the Federation, as Weyoun 6 believed that the Dominion War was a mistake, but his programming meant that he still saw the Founders as gods; contacting Odo was as close to a compromise as he could come. Due to an attack perpetrated by Weyoun 7 and four Jem'Hadar ships, the attempt failed and ended with Weyoun 6's death; he triggered a termination implant in his brain that killed him in a matter of minutes. At this time, Weyoun also revealed that the Founders were all dying of a strange disease, and Odo was the only one who seemed unaffected by the disease. Some time after this, it was revealed that Odo was the original source of the morphogenic virus that was killing the Founders, having been infected by Section 31 during his brief visit to Earth, in an attempt by Section 31 to end the threat of the Founders by committing genocide. Odo was beginning to die of the disease himself, but after tricking Section 31 agent Luther Sloan into coming to DS9, Bashir was able to discover a cure for the virus, although it necessitated him and O'Brien each using a neural interface to enter Sloan's dying mind when the agent tried to kill himself rather than reveal the cure. Odo was instrumental in ending the war with the Dominion. He and Colonel Kira joined a Cardassian resistance group led by Damar. As such, Odo provided valuable help in Damar's fight against the Dominion. When the Female Changeling refused to order Jem'Hadar and Breen forces to stand down, Odo linked with her, curing her of the virus and convincing her that she was wrong about solids and to stand trial after ending the war. In exchange, Odo agreed to return to the Great Link permanently to help build a new Dominion, and to cure his people. This meant the end of his relationship with Kira, though he was accompanied on his return to the Great Link by Kira. As he merged into the Link, he changed into a tuxedo, which Kira liked him in. Soon after arriving at the link, Odo confirmed that there was indeed genetic material on file for the cloned Vorta Weyoun, despite previous claims. Odo had a new Weyoun cloned to act as his personal Vorta assistant. Three months after rejoining the Great Link, Odo assigned Taran'atar, a Jem'Hadar soldier that was not addicted to the drug Ketracel White, to travel to Deep Space 9 and act as an observer of the species of the Alpha Quadrant. Odo's hope was that the Jem'Hadar could eventually learn to be more than blood-thirsty soldiers. Other than sending Taran'atar the Link was generally unreceptive to Odo's ideas of bring more peace to the Dominion. Odo remained an outsider and spent much of his time in solid form, receiving verbal communications from Laas when the Link made decisions. Soon after dispatching Taran'atar to DS9, rumors reached the Great Link of a holy woman speaking of the Prophets and of healing. The rumors also said that this woman had had contact with a mysterious race known only as the Ascendants, a dangerous race that the Link knew very little about. Believing this woman to be the lost Bajoran Kai Opaka Sulan, Odo disguised himself as a Trelian woman named Wex and set out in search of her. Odo eventually found both Opaka, and Jake Sisko, who was on his own adventure in the Gamma Quadrant. Opaka's knowledge of the continued existence of the Ascendants was important information for the Dominion, but Odo couldn't return to the Link without first seeing Opaka and Jake back home to Bajor. Upon arriving back at the station, Odo quickly found himself in the middle of the Parasite crisis. Reuniting with his love Kira, Odo assisted in the liberation of the monastery at Ashalla, which was the stronghold of the alien parasites. Odo stayed with Kira at DS9 for approximately a month, long enough to attend Bajor's admittance into the United Federation of Planets. Odo and fellow member of the Hundred, Laas, learned the truth as to why they were sent out into the galaxy as infants at the end of the year 2376. They evolved, just as the Female Founder said, but upon further research and wondering, why in all of the known galaxy are they unique and so different from all other encountered life. Following up on Odo's findings at the planet where the simple, kind of Changeling cousin was found they find evidence that their evolution was meddled with through genetic engineering, much like they've done to the Vorta, just not as extreme. They were already headed in the general direction they are but someone(s) vastly accelerated the process. Longing to know if after all these thousands of years if they are truly all there is they send out the equivalent of an expeditionary force of Jem Hadar, Vorta and Changelings to find their original homeworld. Approximately one third of the Founders go on the mission in a fleet of ships (and one ship specifically designed to contain the smaller link by simulating the conditions on the world where Odo found them the first time). They find a colony where deep buried ruins on a burnt up world around a white dwarf (the results of its Sun going nova) and find evidence that their homeworld is somewhere near the Gamma Quadrant/Delta Quadrant border near Borg Space. Two thirds of the great link remain behind to keep control of The Dominion while the other one third go off to find the original homeworld, if it still exists. Odo got tired of being shutout as the more moderate Founders left and the hard liners stayed behind, those that longed for the days of complete Dominion supremacy. They won't listen to Odo and so he decides to return to DS9. In November 2379 Odo returned to the Alpha Quadrant to visit Kira and elected to remain a while and took over as Security Chief since Ro Laren was promoted to First Officer. When Odo returned to the Alpha Quadrant he brought some intelligence reports for Admiral Kira regarding the Dominion in the Gamma Quadrant. After Lieutenant Bemi reported that Odo was a civilian working as Security Chief Admiral Akaar, the Head of Starfleet Security, insisted that Odo accept a Starfleet rank and approved the rank of Lieutenant Commander for him should he elect to be absorbed into Starfleet which he did. Not long after arriving in the Alpha Quadrant Admiral Akaar temporarily transferred Odo to the Constitution class Enterprise as Acting Security Chief due to Lieutenant Galloway overstepping his authority in arresting Cadet Adarra after Captain Spock was injured. After Lieutenant Galloway's death Odo was reassigned to Deep Space Nine and was given the assignment of investigating his murder.